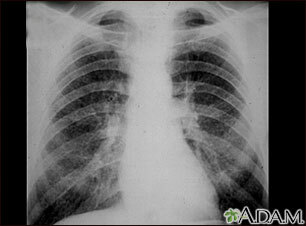 This chest x-ray shows stage II coal worker's pneumoconiosis (CWP). There are diffuse, small light areas on both sides of the lungs. Other diseases that may explain these x-ray findings include simple silicosis, disseminated tuberculosis, metastatic lung cancer, and other diffuse, infiltrative pulmonary diseases.